Supercomputers. There probably isn’t a tech geek out there who doesn’t find them intriguing. Huge, hulking computers with performance that’s ages ahead of what we have on our desktops. They are the most powerful computing devices on the planet. But where in the world do we find these supercomputers? Where are the fastest ones located? Which countries have the most of them? Read on to find out. It turns out that eight of the ten fastest supercomputers are in the United States. The other two are located in Germany and China. We have written about a few of these supercomputers in the past. You might want to check out this article about Jaguar and this one about Jugene. For those interested, the complete list of the top 500 supercomputers is available at Top500.org. So, 80% of the 10 fastest supercomputers are in the United States. What if we expand our scope a bit and look at the top 500 supercomputers out there? Not only does it dominate the top 10, the United States dominates the list of the top 500 supercomputers in the world as well, although not to the same extent. More than half of the top 500 supercomputers are located in the United States. Another observation here is that the top ten countries hold 89% of the top 500 supercomputers in the world. Us being Swedes, we would have loved seeing Sweden make it into this top ten list, and we almost made it. With seven supercomputers, Sweden comes in at number 11. Where are the fastest supercomputers if you don’t look at countries, but at regions instead? Granted, we know already that North America will have the biggest piece of the pie since the United States has so many supercomputers, but it’s interesting to see how the other regions of the world are doing. Nine of the eight supercomputers in Oceania are in New Zealand, one in Australia. Four of the supercomputers in the Middle East are in Saudi Arabia and the other two in Israel. The one in Africa is in South Africa while the South American one is in Brazil. While we were going through the supercomputer information on the Top500.org site (the data source for this article), a few other things struck us as particularly noteworthy. Here below you can see the division by operating system family across the top 500 supercomputers. As you can see, Linux has close to 90% of the supercomputer market. Quite an impressive feat. We wrote about the triumph of Linux as a supercomputer OS last summer. It’s an area where it dominates almost completely. Windows, on the other hand, is only used by 1% (5 out of 500). You might ask yourself where you go to buy one of these huge computer systems, and here you go, the top ten vendors of supercomputers (again, based on the top 500). The remaining vendors make up 4.4% altogether. It should be noted that although HP is the leader in terms of sheer quantity, IBM and Cray have the two fastest systems. Supercomputers are used for a ton of different purposes, often scientific in nature. They are for example a valuable resource to many universities. As we have shown here they are spread all over the world, albeit with a heavy bias towards the United States and Europe. 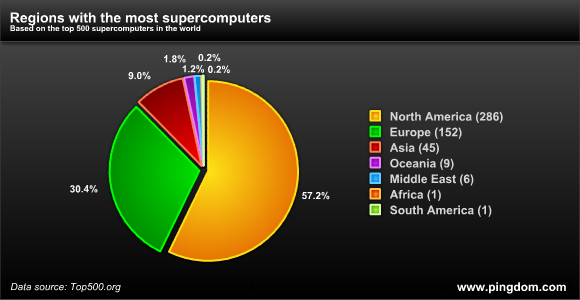 However, these stats show that the supercomputing hotbed is definitely the United States. The fact that the country has more than half of the top 500 supercomputers in the world, and eight of the ten fastest, is made all the more impressive when you consider that the United States only account for less than 4.5% of the world population and 13% of the internet users. Photo credit: CM-5 photo by Tom Trower (from here). Would posit that public info about #s and locations of superfast computers is inevitably way wrong, because the vast majority of the biggest and fastest are used in military & intelligence gathering (i.e., NSA in US). As such, ludicrous to suggest that Russians do not have a top 10 machine simply because it’s unknown to your source. Best to amplify disclaimers from orig source as to sources of info, supposing to measure mainly those used in commercial & research settings, likely excluding all (or most) used in military/intel settings worldwide. Show your colours, Pingdom! 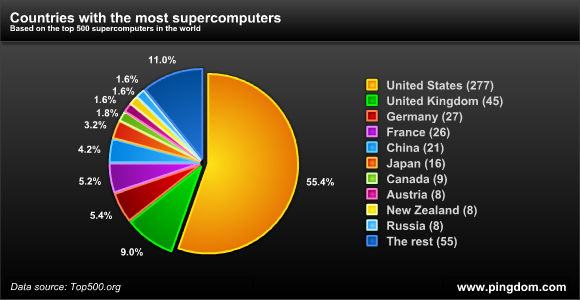 I’d like to see an updated graphic for the Supercomputers by Country piechart that includes Sweden at number 11. Heck, 10 is just an arbitrary number, plus one for the Rest, so why not 12 instead of 11 rows?